The rise of NFC chips ushered in an era of sophisticated mobile payment options like Android Pay, Apple Pay, and many others. With the beginning of great things, the lesser ones must come to an end as Google Wallet seems close to meeting it’s maker. Uber is the latest mobile app service to jump the Android Pay bandwagon, who plans to bring the service starting May 9. 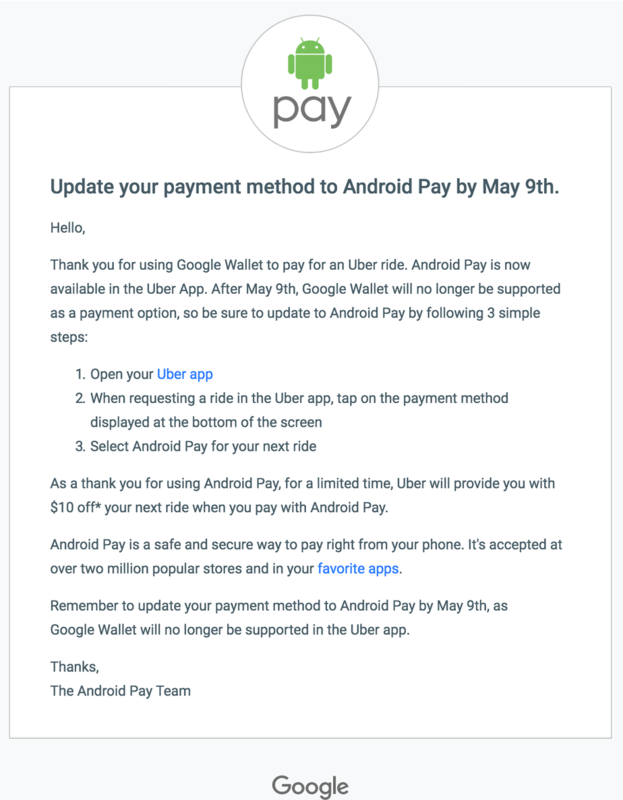 Users who have used Google Wallet in the past to book rides with Uber have received an email from the company, announcing the arrival of Android Pay, and farewell to Google Wallet. Apart from Credit/Debit card and PayPal, Android Pay will be the available option for users to pay for their Uber rides. In order to promote Android Pay and give some consolation to those who will miss Google Wallet (if there are any), Uber will offer $10 off the first ride when using Android Pay. You won’t have to update your Uber app to see the Android Pay option later next week, as it will automatically show up on the payment page of the app. The tap and pay technology is quickly catching up, and Android is not the only big fish in the pond to offer it. Apple Pay and Samsung Pay are strongly competing in the consumer market, which is swiftly adopting the new mobile payment method. Xiaomi has also announced its very own mobile payment service that will be rolled out in China, which might just put it at the top of the food chain based on the sheer number of users per capita. Are you bummed out about Google Wallet being dropped by Uber in favor of Android Pay? Do you think it the necessary evil to cut short Google Wallet to keep up with Apple Pay? Let us know your thoughts below in the comments.